The Board for Certification of Genealogists and Legacy Family Tree Webinars are excited to announce a new partnership. Legacy, host of the webinar series at FamilyTreeWebinars.com, will now also serve as host, producer, and publisher for future BCG webinars. This arrangement will produce and promote high-quality education in genealogy standards and methodologies by one of the leading creators of genealogy webinars. Legacy Family Tree Webinars is a leader in the field of webinar production and management. BCG is excited to bring this level of technical quality and experience to its webinar series, which offers educational opportunities on topics of certification, genealogy standards, and methodologies. Held on the third Tuesday of the month when scheduled, BCG webinars are presented to educate and raise awareness of genealogy standards. Registration for live webinars will be available at http://bcgcertification.org/blog/bcg-webinars and at www.FamilyTreeWebinars.com. Registration is free and is open to the public. Recordings of BCG’s live webinars are available at both http://bcgcertification.org/blog/bcg-webinars and at www.FamilyTreeWebinars.com/bcg. 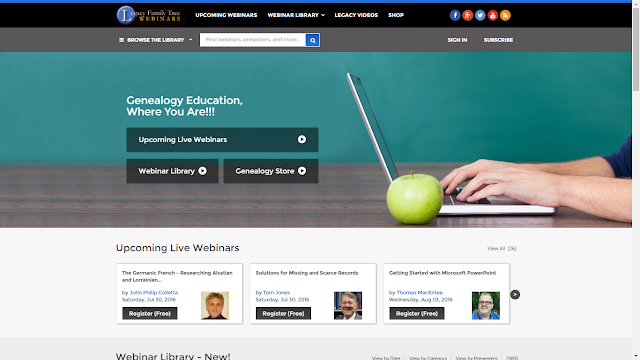 Some are free for a limited time after the live event, while others are available with an annual or monthly membership to Legacy Family Tree Webinars. Legacy Family Tree Webinars (www.FamilyTreeWebinars.com) and Legacy Family Tree software (www.LegacyFamilyTree.com) are part of Millennia Corporation, founded in 1984 and headquartered in Surprise, Arizona. * John Philip Colletta on "The Germanic French - Researching Alsatian and Lorrainian Families" at 2 p.m. EDT (11 a.m. PDT) - Register for the live webinar at http://familytreewebinars.com/webinar_details.php?webinar_id=359.